Achieving optimum results requires being better right from the start, because mistakes made during dough preparation can hardly be made well. 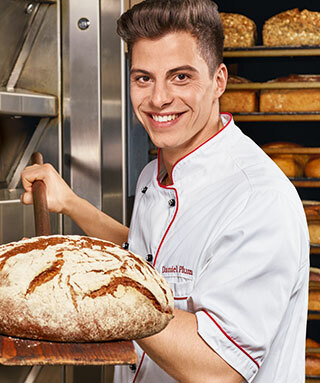 König's universal spiral kneading machine ensures optimum product quality right from the start - whether for wheat, wheat mix, rye mix, rye or scrap dough - König spiral kneaders knead quickly and hardly heat the dough. Like all König kneading machines, the spiral kneader is equipped with an extendable dough tray as standard, thus ensuring an efficient workflow combined with a high level of operating convenience. Because the interaction of kneading speed and the speed or direction of rotation of the kneading bowl can be precisely set by the operator and stored in the control program, the models of the SP series can be used universally and adapted to almost any recipe.